Rambutan is a sweet, delicious fruit with succulent and fragrant white flesh. Here's what it looks like fresh. An add looking fruit with hairy appearance. Best served in a bowl mixed with ice cubes to chill. We offer a premium quality Aroy-D brand, noted as the finest in Thailand. 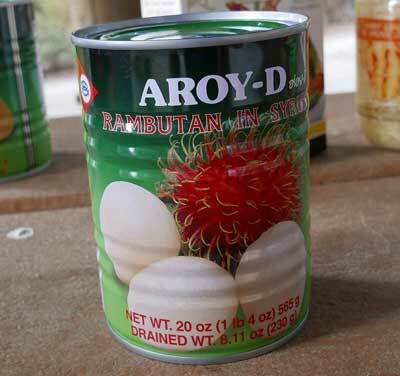 This is the best canned rambutan on the market. Ingredients: water, rambutan, sugar, citric acid. Product of Thailand. More on Rambutan. The rambutan is a medium sized tree producing a red or yellow fruit round to oval in shape. Its thin, leathery rind is covered with tubercles from each of which extends a soft, fleshy, red, pinkish, or yellow spine 1/5 to 3/4 in long. The somewhat hairlike covering is responsible for the common name of the fruit, which is based on the Malay word "rambut", meaning "hair". Within is the white or rose-tinted, translucent, juicy, sweet flesh, adhering to the oblong seed. The rambutan has a small crop in June - July and a heavy crop in November to January. Rambutan is indigenous to the Malay Archipelago and has been widely cultivated throughout the region in Thailand, South Vietnam, Indonesia, the Philippines, India and Sri Lanka (source).